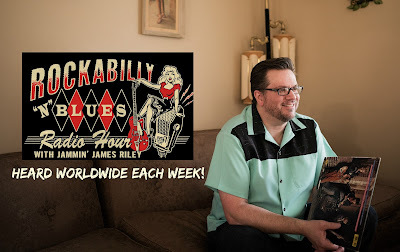 "James Riley, and his rockabilly show, has a love for the music like I do with artists like Gene Vincent, Eddie Cochran, Buddy Holly and Ricky Nelson. Then there's the guitar heroes that flew under the radar like Scotty Moore, James Burton, Cliff Gallup & Paul Burlison. I knew and loved all these guys. Thank God for James Riley who keeps the music alive!!! Rock on!" "James Riley and his Rockabilly N Blues Radio Hour are so important to keep great music alive! He treats me and my music with such reverence and respect and I'm thrilled to be a part of the show whenever he asks." "If you love rockabilly and roots music like I do, then you will love James Riley. You can hear the classics and the best of today's music as well. James loves this music and it shows. Do yourself a big favor, tune in and dig the Rockabilly N Blues Radio Hour with Jammin' James Riley!" "I am thankful for James Riley and the Rockabilly & Blues Radio Show for numerous reasons. James is keeping this great music alive for future generations. Secondly, he is allowing artists, like myself, to still have a voice in the public media about the things that matter to us. Thirdly, he is such a joy to work with and his passion and dedication is unsurpassed in the music business today. Thank you James....you are making a major difference for us all! "James is the man. He has been a strong supporter of roots-rock music and Lanark Records and has spread the word on both! His shows are filled with great interviews and even better music. Want to learn about real roots music? Then tune into James’ show for a great education and even better entertainment!" "In a time of cookie-cutter radio and music, James' approach to bringing classic & timeless tunes to the listener does my heart GOOD!" "The Rockabilly N Blues Radio Hour plays such good music, and it’s obvious that it’s all being done from the perspective of a true fan of the music. That’s what makes it a joy to listen to. Jammin’ James curates the show with a deft hand, fitting together a wide range of music that not only satisfies traditional fans, but also reaches into modern styles in a way that all melds together perfectly. We here at Dr. Rubin’s are VERY honored to be a part of the show, and each week we are extremely proud to share it with our awesome fans!" "James has been instrumental in helping Lanark Records get into the big picture. I feel fortunate to work with someone with his enthusiasm and passion and knowledge of music. James Rocks!" "We've been carrying The Rockabilly N Blues Radio Show for less than a year now and the response from our Mississippi listeners has been phenomenal! Since we have a self-built Blues, Classic Rock and "Stuff" format, RNB was a perfect fit. Jammin' James Riley's voice and informative broadcasting style compliments our station and even our foreign listeners both online and those who visit the station inquire about the "Pomade" and other sponsors on the program. The Rockabilly N Blues Radio Show is long overdue and would fit any station that wants to generate more revenue, satisfy a variety of its listeners and up its ratings. Want to diversify your format with a winning combination? Add Jammin' James Riley and RNB!" "Jammin' James Riley has been bringing the South Shore of Massachusetts a fresh, informed take of Rockabilly and Blues for the past few months. Now that we are streaming to the world, we are bursting with listeners for our Sunday Night Blues format, and his show is an absolutely perfect complement! His talent and professionalism are unmatched and we look forward to his show every week!" "At a time when everyone with a Mac and a Microphone has a 'radio show,' Jammin’ James Riley reminds us of an era when radio talent had TALENT! With his entertaining style, legendary guests and broad knowledge of rockabilly and blues, Riley produces a fascinating program that is unlike any other. And that’s why we’re honored to provide access to guests for the show. If you haven’t heard the Rockabilly N Blues Radio Hour, then you’re wasting the best hour of your day!" "James Riley presents a highly entertaining program with a terrific mix of rockabilly, a touch of blues and a heapin' handful of personality. A great listening experience!" "James Riley knows how to throw a rockin' radio party. Diverse, informative and entertaining, James mixes genres with interviews and plays selections that would please anyone's musical tastes. Definitely a favourite of mine. Big 10/10 from Canada!" "Magic Oldies Florida and Magic Oldies on the world wide web is a proud station affiliate. James plays the best of the new Rockabilly music along with many of the past favorites. The Rockabilly N Blues Radio Hour with James Riley is awesome!" "Music is history and records are moments in time captured forever. James Riley puts it all in perspective!"